Charleston, South Carolina is a city famous, among other things, for its historic churches. A walking tour of the city, especially along Meeting Street, offers the opportunity to travel through time as it were and explore places of worship and graveyards that continue to testify to the faith of our forefathers. 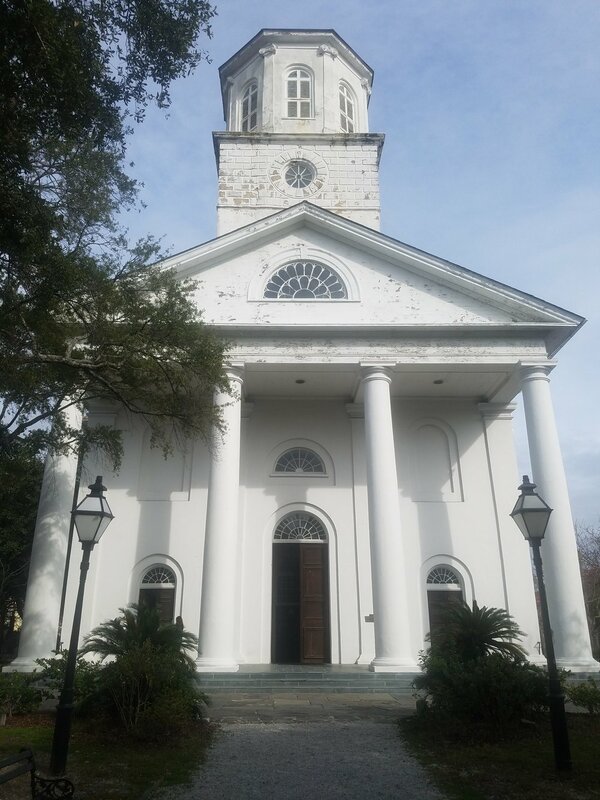 This writer had such an opportunity recently and was privileged to visit such churches in Charleston and the surrounding vicinity. A trip to Elmwood Cemetery, Columbia, SC, was part of the experience as well, where John Lafayette Girardeau, James Henley Thornwell and George Andrew Blackburn were laid to rest between 100 and 150 years ago. Having consulted several resources beforehand — Erskine Clarke, Our Southern Zion: A History of Calvinism in the South Carolina Low Country, 1690-1990; Charles E. Raynal, Johns Island Presbyterian Church: Its People and Its Community From Colonial Beginnings to the Twenty-First Century; George Howe, History of the Presbyterian Church in South Carolina; and Joanne Calhoun, The Circular Church: Three Centuries of Charleston History — I made my way first to the Johns Island Presbyterian Church (founded in 1710, its building dates to 1719 — three hundred years ago now). As with many of the churches I toured, the graveyard is an ever-present Memento mori. Next on the tour was the James Island Presbyterian Church (founded in 1706). Both of these churches were established by Archibald Stobo, a Presbyterian pioneer who also founded the first presbytery in the Western Hemisphere, as well as in the southern United States. He established other churches in the area which I do hope to visit on a future tour. In Charleston proper, my walking tour began with a visit to the Unitarian Church, which began its existence in 1774 as the Archdale Street Meeting House, founded by Dissenters who branched off from what we know now as the Circular Congregational Church, originally a mixed Independent and Presbyterian Church, itself founded in 1685. William Tennent III (grandson of the founder of the original Log College) is buried on the grounds of the Unitarian Church, though he was no Unitarian. The fan vault ceiling is modeled after the one at King’s College Chapel, Cambridge. Next, was the First Scots Presbyterian Church on Meeting Street (founded in 1731). It was another breakaway from the Circular Congregational Church, by a decidedly Presbyterian group. George Buist is buried in the church graveyard. Further along Meeting Street is the Circular Congregational Church, a remarkable architectural and spiritual landmark, where I paid my respects at the graves of David Ramsay and Benjamin Morgan Palmer (1781-1847). 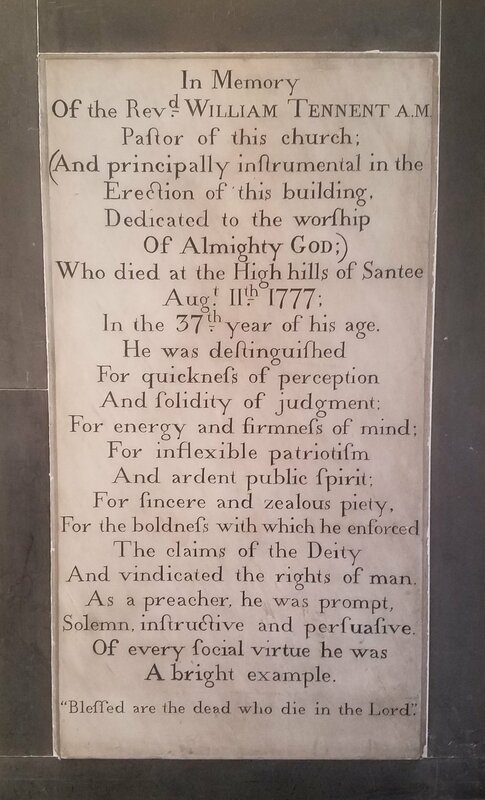 After this, I visited the Second Presbyterian Church of Charleston (founded in 1811), where I was given a tour of the sanctuary and the graveyard (Thomas Smyth and John Bailey Adger are laid to rest there). 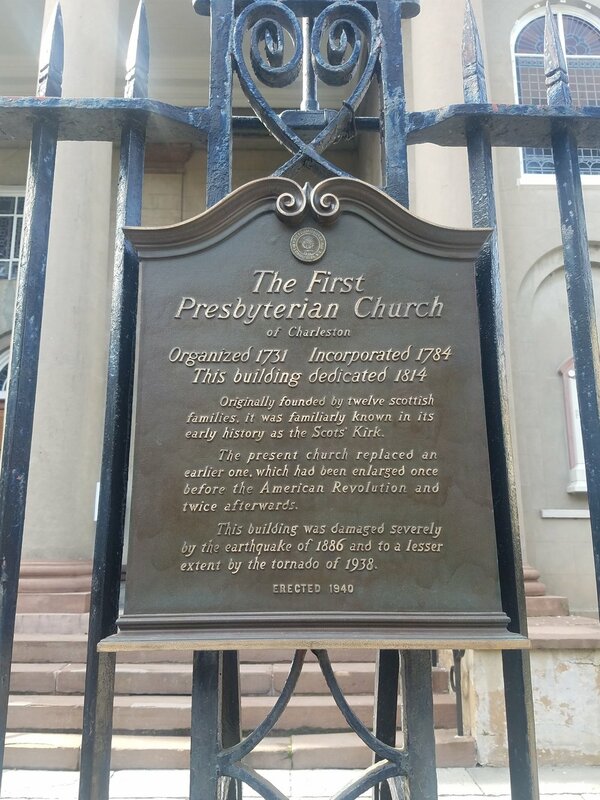 Also on my tour I worshiped at the Independent Presbyterian Church of Savannah, Georgia (founded in 1755). At each stop along the way, I was reminded that the past is not dead, and American Presbyterians are not irrelevant. The old Presbyterian history of the South Carolina lowcountry is very much alive for those with eyes to see. Most Presbyterians are familiar with the Westminster Shorter/Larger Catechisms, or the Heidelberg Catechism. But have you heard of Ecclesiastical Catechisms? At least two were written by Presbyterians in America in the 19th century: one by Alexander McLeod (1806) and one by Thomas Smyth (1843). (Another was written by Luther Halsey Wilson titled The Pattern of the House; or, A Catechism upon the Constitution, Government, Discipline and Worship of the Presbyterian church, which we hope to add to the site in the future.) These books present the doctrine of the church in question and answer format, so that God's people might more easily understand what the Scriptures teach about the institution that Jesus is building. McLeod and Smyth won't agree on everything (for instance, the number of offices Jesus has appointed in His church), so comparing and contrasting these two documents, written 40 years apart, will undoubtedly be an edifying and rewarding use of your time. Note: This blog post was originally published on November 8, 2017 and has been slightly edited. "It is evident that parents are laid under obligation not only to ‘train their children in the way that they should go, that when they are old they may not depart from it,’ but also to ‘bring them up in the nurture and admonition of the Lord,’ that is, (as the words certainly mean, and should be rendered in order to make them more intelligible,) ‘bring them up in the education and discipline of Christians,’ that is, of those who ‘are the Lord's.’ We are thus taught that our children by their baptism are devoted to the Lord, and become members of his church and kingdom, and that we are under obligation to bring them up as such, not merely by instructing them, and thoroughly imbuing their minds with Christian truth, but also by accustoming them to, and interesting them in, every part of Christian activity, devotedness, and zeal. "It follows, therefore, as an undeniable inference, that it is incumbent upon every Christian, parent, teacher, and church, to see to it that the children of their charge are brought up as the Lord's, — as Christians, — as members of his visible church, — and therefore not only as those who ought to believe in him, and to know the doctrines that are of God, but as those who are bound also to love him, to serve him, to honor him, and to co-operate, according to their measure of ability and their sphere of influence, in the promotion of his glory, and the advancement of his cause. And as the term ‘Missionary’ is employed to designate the work of making known ‘the glorious gospel of the blessed God’ to those that know it not, — which is the great work and duty of the church, and of every Christian — it is therefore our manifest duty to bring up our children in a missionary spirit, and in a missionary practice. "[It] is utterly impossible to have a missionary spirit, unless the heart is full of love and devotion to the cause of Christ; unless we can with pleasure give up everything however much it might add to our present comfort or happiness if it interferes with our duty; and unless we can bear all sorts of privations and trials that we may meet with in that narrow path. In short, to be able in all things to give up self, and think only how we can best serve God, promote his glory, and do his will, this alone is a real Missionary spirit. But this is the very spirit which must be shown, if we would see God's glory promoted, in every situation of life in which it may please him to place us. And hence we have seen some people who never went ten miles from home, do as much good in winning souls to Christ, as if they had left their country and travelled thousands of miles to reach the heathen. Missionaries, therefore, in the true sense of the word, but above all, a Missionary spirit, are needed everywhere! and in every condition of life." -- from Thomas Smyth, "The Duty of Interesting Children in the Missionary Cause," in Complete Works of Thomas Smyth, Volume 7, pages 332, 345. Should Christians raise children who love missions? Thomas Smyth says, "Absolutely. And here's what that means." "It is evident that parents are laid under obligation not only to “train their children in the way that they should go, that when they are old they may not depart from it,” but also to “bring them up in the nurture and admonition of the Lord,” that is, (as the words certainly mean, and should be rendered in order to make them more intelligible,) “bring them up in the education and discipline of Christians,” that is, of those who “are the Lord's.” We are thus taught that our children by their baptism are devoted to the Lord, and become members of his church and kingdom, and that we are under obligation to bring them up as such, not merely by instructing them, and thoroughly imbuing their minds with Christian truth, but also by accustoming them to, and interesting them in, every part of Christian activity, devotedness, and zeal. "It follows, therefore, as an undeniable inference, that it is incumbent upon every Christian, parent, teacher, and church, to see to it that the children of their charge are brought up as the Lord's,—as Christians,—as members of his visible church,—and therefore not only as those who ought to believe in him, and to know the doctrines that are of God, but as those who are bound also to love him, to serve him, to honor him, and to co-operate, according to their measure of ability and their sphere of influence, in the promotion of his glory, and the advancement of his cause. And as the term “Missionary” is employed to designate the work of making known “the glorious gospel of the blessed God” to those that know it not,—which is the great work and duty of the church, and of every Christian—it is therefore our manifest duty to bring up our children in a missionary spirit, and in a missionary practice. -- from Thomas Smyth, "The Duty of Interesting Children in the Missionary Cause," in Complete Works of Thomas Smyth , Volume 7, pages 332, 345.